I have a small obsession with Red Velvet, it's amazing. The cream cheese frosting is my favorite part. 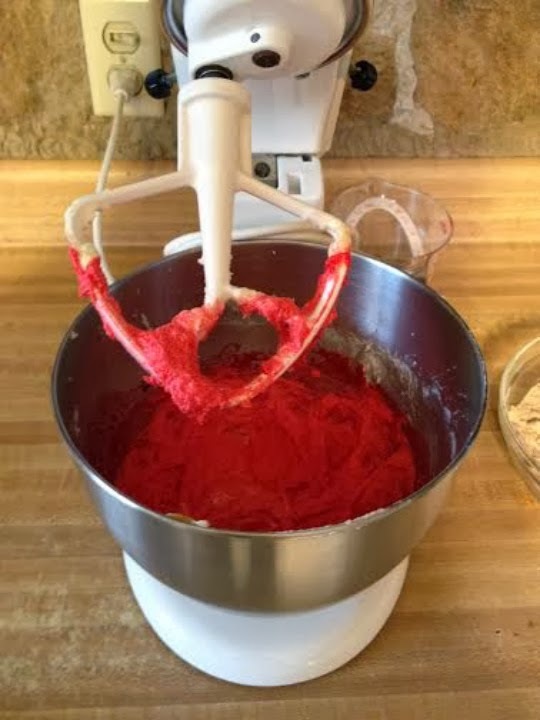 When I came across a recipe for Red Velvet Sugar Cookies with Cream Cheese Frosting I knew I had to make them! 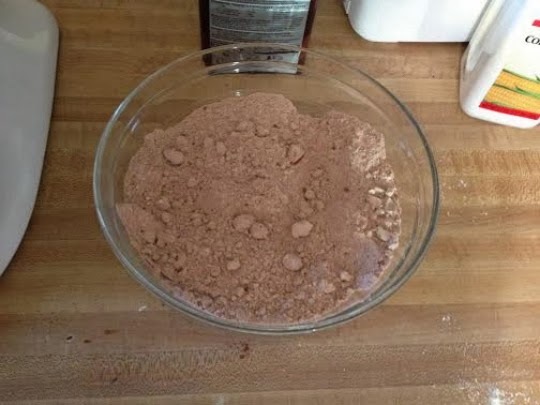 Instructions: -Mix together flour, cocoa, cornstarch, & baking powder in a bowl, set aside. -With an electric mixer whip butter, shortening, & sugar until pale & fluffy. 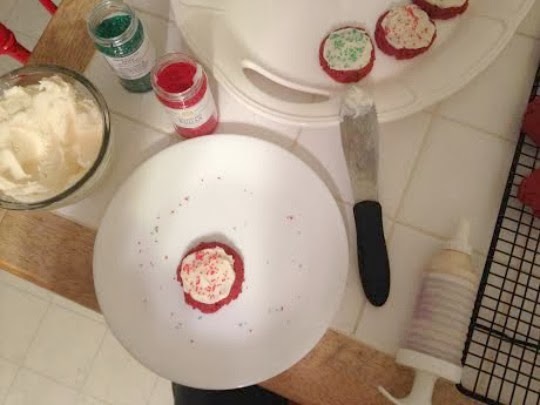 -Mix in egg, then mix in egg white, vanilla extract, & food coloring. -With mixer set on low speed, slowly incorporate the flour mixture, & mix until just combined. -Cover dough & put in fridge for 2 hours. 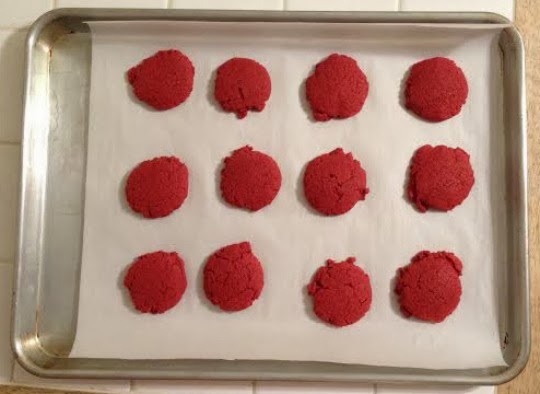 -After chilling, shape dough into small balls & place on cookie sheet covered with parchment paper. 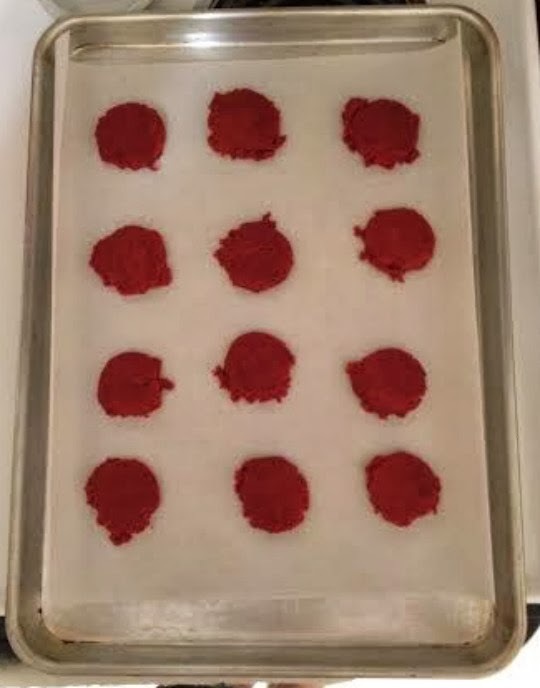 -With a small square piece of parchment paper between your hand & the cookie evenly flatten balls to about 1/2 inch. -Bake at 375 degrees for 9 to 11 minutes. -Transfer from cookie sheet onto wire cooling rack. -Allow to cool completely then frost. Instructions: -With an electric mixer beat cream cheese & butter until pale & fluffy. -Mix in vanilla. -Slowly add powdered sugar while mixing. -Blend until well combined & fluffy. 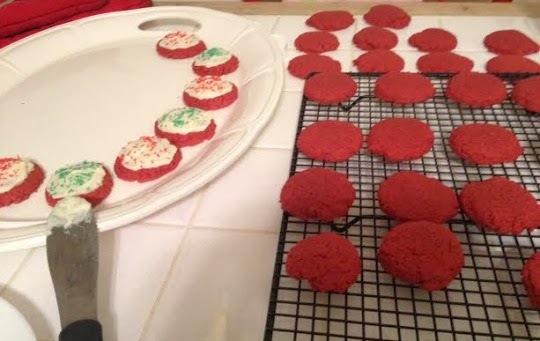 -Use to frost completely cooled cookies. 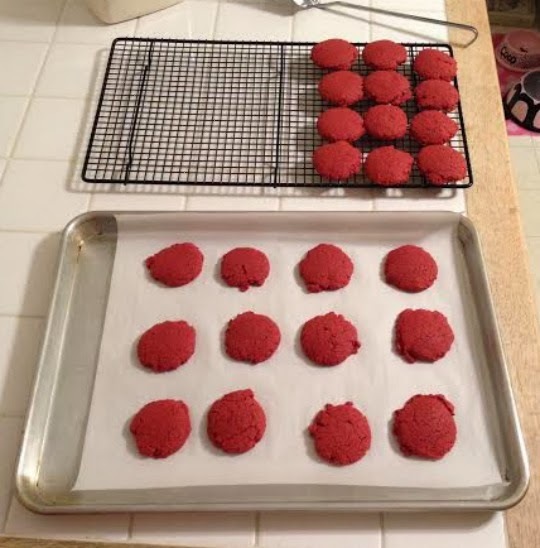 These cookies bake exactly as you place them on the cookie sheet, so if you want perfect circle you have will have to shape them that way. 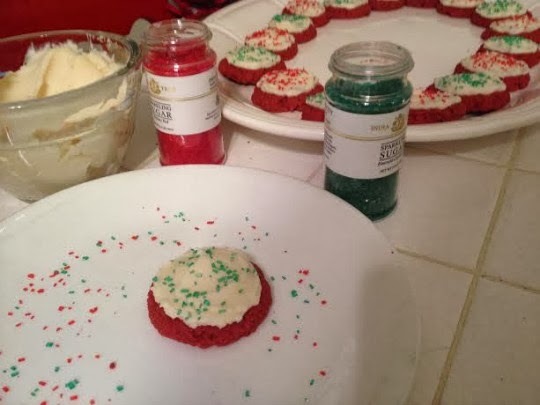 After I frosted mine I decided to dress them up a bit with red & green sugar sprinkles. 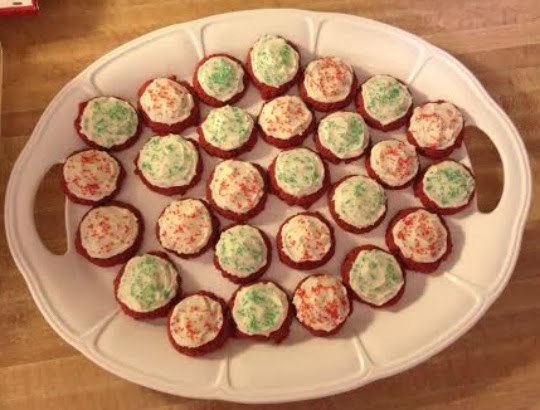 These are so yummy & taste just like a red velvet cupcake! This may be one of my new favorite cookies! 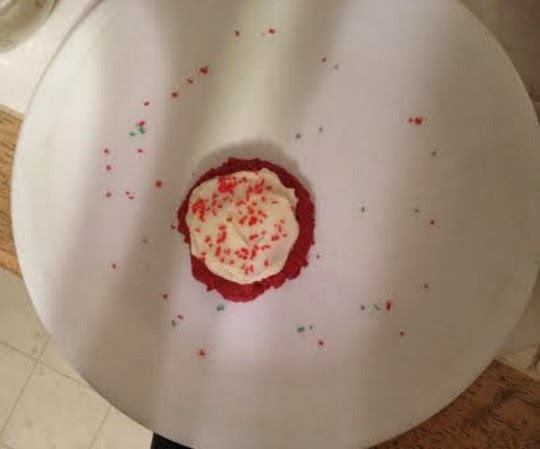 Have you ever had a red velvet cookie? These look so good and festive!! Love the red and green theme, very festive! I'll be sure to try these soon. Love this! Please check out my blog www.loveolia.com! These look delicious! Love how festive they look too! Happy holidays!